Important day here in Sweden and we start once again early. Breakfast at 8 and then we go and watch Molly and Brooke play at 9 am in playoff game. They lose in PKs but Molly played great. The boys were cheering the entire girls team on and it was priceless. Back to hotel to rest for the Boys A team while the Boys B team goes to Heden to watch some games. We have been doing match analysis so its nice to see the group spending so much time watching and learning. Its important to do that. 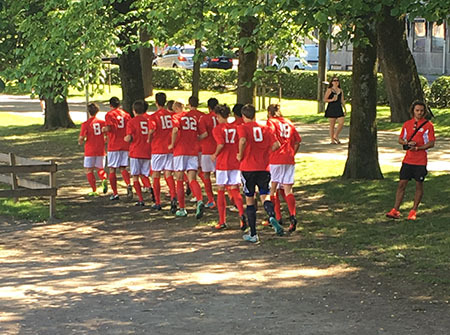 Boys A have a game at 3 pm at Heden and the place is packed and they are excited for the chance to play in the round of 16. We play against Orgyte IS, a professional club here in Gothenburg and we have a nervous start and give up an early goal. That did not calm us down and Orgyte is a great team. We lose 6-0 but what an experience and boys played their hearts out till the end. Great run for us and so proud of all. 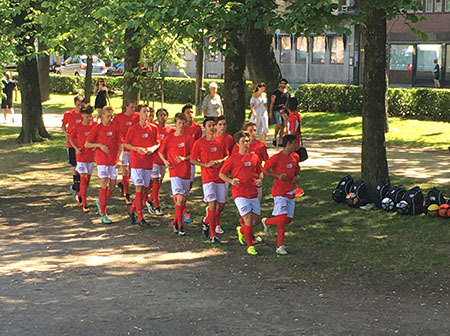 After the game, we eat dinner and then the group goes to watch IFK Goteburg, the most famous of all Swedish pro teams, play in Europe League play in game vs. a team from Poland called Piast Gliwice. Game tied 0-0 and was a poor game but still good to see. Weather is once again spectacular and we cannot complain. Now its time for the kids to relax and slow down a bit. We have been going fast and furious for almost 3 weeks and they deserve a break. We have great kids on this tour, just a pleasure to be around and funny as well. Just wait for the video as it will unveil a lot of funny stuff. Combining kids from Dallas, Colorado, Houston, Columbus, and then add a Swede and a Norwegian, what a mix and it works every day. Gonna be hard to say bye to each other!! !